I usually start the bread/pizza dough in the morning, abandon it on the counter, and brag about how I’ve got dinner started already. I make the sauce closer to pizza assembly time, just because I can be lazy in the mornings. We used to make slow cooked tomatoes sauces, but they can be a little wet. I came across Smitten Kitchen’s pizza sauce recipe last year and haven’t looked back. The strained tomatoes sauce is thicker, easier, and let’s be honest, you don’t appreciate a nice slow cooked sauce on a pizza anyway. We use coarse polenta on a rimless baking tray to stop the pizza from sticking while we dress the base. 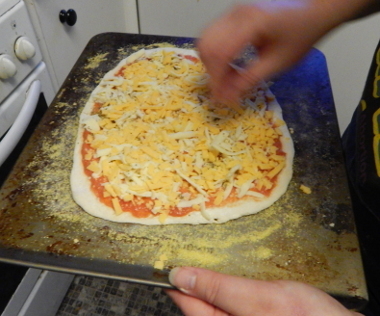 The pizza can then be slid directly on to the hot pizza stone for baking. Mix all the dry ingredients in a bowl, a good mix so everything is evenly distributed. Then add the water and give it a good stir with a strong spoon. You can mash it about with your hands for a bit if you think you haven’t given it a good enough mix with the spoon. Getting the dough off your hands is a pain, you can scrape it off and then wash them with loooooads of soap. Cover the bowl and ignore it for at least two hours, ideally leave it for six to eight hours. Strain the tomatoes. Keep the strained liquid for some other recipe (baked beans or bolognaise are good). Put the strained tomatoes into a narrow container, add the garlic and salt, then use a stick blender to blitz the sauce till it’s smooth. If you don’t have a stick blender, crush the garlic and then mash into the tomatoes until it’s as smooth as you can get it. Set the sauce aside. This is enough sauce for four pizzas for hungry adults. Pre heat your oven to as hot as it gets, if you’re using a pizza stone put it in while the oven is cold. I usually let the stone heat for 20 minutes and start preparing the bread while the heating happens. I put the stone on the bottom rack of our conventional oven (top and bottom elements), when we used a fan oven it stayed in the middle, when I visit my mother the stone goes on the top shelf of her conventional (side elements) oven. Get a baking tray with no sides for transferring the pizza to the stone (or baking the pizza on directly if you don’t have a stone) and sprinkle some polenta on to stop the pizza base sticking. Put plenty of flour on the worktop. Plop the dough out of the bowl on to the counter. If it’s a bit wet, use dough scrapers to fold it on itself a few times. If it’s not too wet, knead it about for a minute. 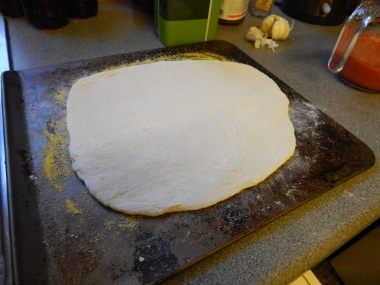 The entire lump of dough will make 6 pizzas for hungry adults, so cut off as many pizza pieces as you’ll need. 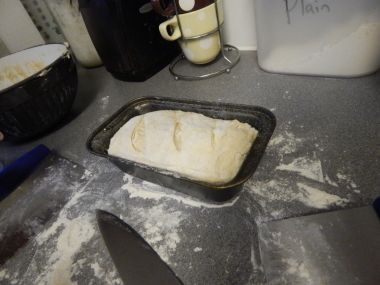 If you have dough leftover, put it into a well oiled 1lb loaf tin, slash the top and set it aside somewhere warm (I leave mine on the grilltray sitting on the hob over the hot oven). For the pizza you can make them thick or thin. 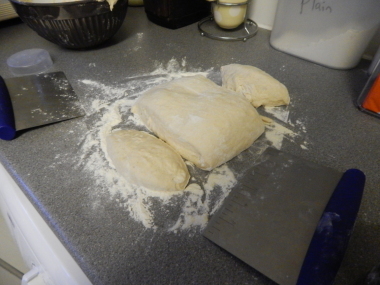 Use plenty of flour, be careful not to tear the dough, but if you do, just fold the dough over and mash it back together. Thin pizzas get rolled out in this house. I’m not going to learn about throwing dough in the near future. People say rolling gives fewer bubbles, but that’s ok, in this case we want a thin crispy base. Sprinkle flour on the dough and counter, turn the dough 90 degrees to get an even shape. They don’t need to be perfect circles or squares, they’re just food. The dough usually ends up less than 5mm thick. I find the easiest way to transfer the base to the baking sheet is to fold it into quarters, move it and unfold it. Thick pizzas I stretch out with my hands, sometimes rolling a little if I’m in the mood. 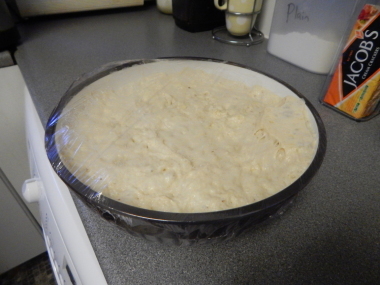 The dough ends up between 0.5 to 1 cm thick. Again, folding them up is the easiest way to move the dough to the baking sheet without tearing. Spread a thin layer of sauce on (especially on the thin bases). 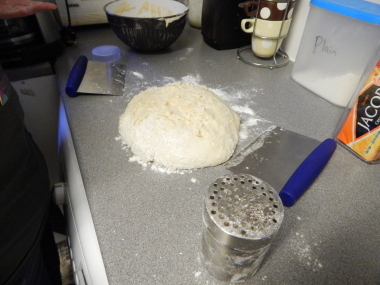 Give the pizza base a little shuffle to make sure it hasn’t stuck (it’ll be difficult to shuffle off if it has, free it and put a bit a bit of flour under it to keep it free). Apply toppings as you see fit. Too much sauce makes the base soggy. If you have a thin base it’ll soak through and make it stick to the tray, so dress the pizza shortly before you plan to put it in the oven. My beloved likes thin base, plenty of sauce and cheese, a liberal sprinkling of oregano, and finishes it out of the oven with chilli oil and black pepper. I like the thick base, thin sauce, more mozzerella than cheddar, plenty of oregano with slices of chorizo and onion or black pudding on top. When I put sweetcorn on, I put it under the cheese to reduce the risk of it rolling off. Going to the oven, rescue any stray pieces of cheese that aren’t on the pizza. Shuffle the pizza off the tray on to the stone (or place the tray into the hot oven if you’re not using the stone) and let cook until the pizza looks delicious (ten to fifteen minutes usually for our rubbish oven). Then slide the pizza off on to a chopping board, add post-oven toppings like black pepper and or a drizzle of pesto, slice and serve. You can put on the next pizza, or give the pizza stone ten minutes to recover (so the next base is as crispy as the first). 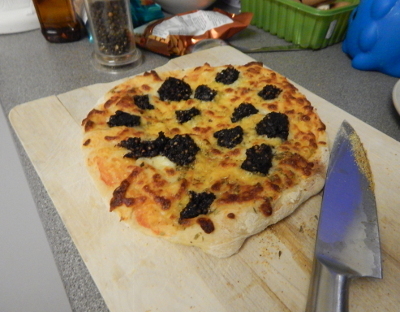 Black pudding is an excellent pizza topping. When the final pizza is done, it’s time to do the bread (if you didn’t use all the dough on pizzas). Doubled in volume while the two pizzas were made. The loaf is good and light and ready for its go in the oven. Take out the pizza stone and leave it on an appropriate surface. Put the bread into the oven on the middle rack, then turn the oven temperature to 200°C. Give the loaf about half an hour and check on it. Take it out of its tin and tap the base, if it sounds hollow it’s done, if it sounds dull put it back in for another ten minutes at 180°C and check again. Leave the loaf to cool before thinking about attempting to slice it. Wrap it in a tea towel for a softer crust, or leave it uncovered for it to stay crustier. Do NOT slice it till it’s cold, you’ll mangle the loaf otherwise. The salt is important for the development of the gluten network. It allows the gluten proteins to come close together and have stronger dough. Don’t forget to add it. Strong flour has a higher gluten content than plain flour. Plain flour doesn’t really work very well for bread, though it can be OK for pizza or yeasted pastries like cinnamon rolls or croissants. Self-raising is terrible for bread (the raising agents in it seem to make the yeast very unhappy). 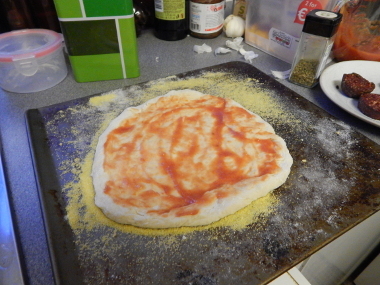 Distribute the salt and yeast through the dough before adding the water. If the salt is bunched on top with the yeast, when you add the water you’re basically drowning the yeast in a salty sea and it won’t be happy. The Horlicks contains milk, you can probably substitute it with some malt sugar and half the water as milk. For the lactose intolerant, leave it out. It’ll still be a nice bread, but it won’t last as long on the counter. The wheatgerm I throw in because I need to use it up (that stuff has a very short shelflife). It’s great in soda bread but you don’t really notice it in the white bread. It probably gives some sort of nutritional value to the pizza and loaf, so if you have it, throw it in and use it up. You can get polenta in healthfood shops if you can’t find it in the supermarket. It’s just coarse maize. It’s also nice pressed into the top of the unbaked loaf. Replacing the pizza sauce with a layer of beef bolognaise is pretty good. You can also press the pizza dough into an oiled pan for deep pan pizzas. Use plenty of oil, and just put the tin onto the stone directly, no need to shuffle the pizza out. If your non-stick tins aren’t very good, use baking paper or a circle of silicone baking sheet, otherwise you’ll end up trying to chisel out the pizza (which will be tasty, but you’ll be angry, so you won’t care). Likewise you can make the loaf into a big tray of focaccia like bread using a tin. Drizzle with extra oil and brush with garlic and herbs. The loaf freezes well, sliced or unsliced. Thanks to my beloved for taking photos while my hands were floury and covered in dough, and proofreading this longer than normal post. 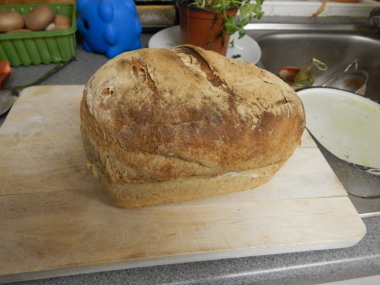 This entry was posted in Delicious and tagged bread, delicious, horlicks, pizza, yeast by Tríona. Bookmark the permalink. 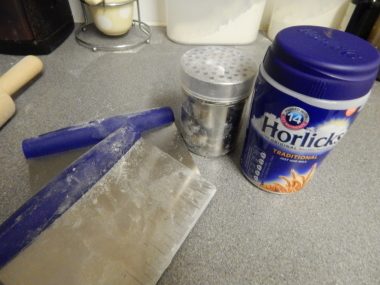 Well now I wouldn’t have thought of using the Horlicks in pizza dough. I think because it has a sweetener in it. Of course (I’m an eedgit) I didn’t think that the sugar would be a good match for the yeast. Sounds fab. I’ll have to try it out with the boys!